During the NASCC conference in Phoenix, Arizona, earlier this month, Design Data unveiled its new slogan: building intelligent connections. Building intelligent connections is about more than automatic connections in SDS/2; it's also a renewed focus on our development relationships with industry partners to improve interoperability. As part of that focus, much of our time at NASCC was spent reconnecting with our partners, networking, and speaking about the importance of interoperability. 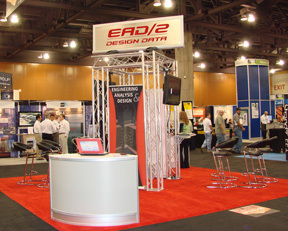 In addition to the SDS/2 booth — which featured a new look — Design Data also had a separate booth for EAD/2, its engineering and analysis software. 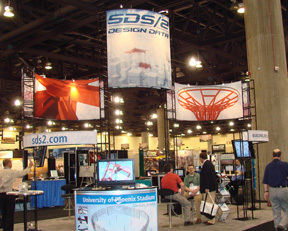 Design Data was the only company at NASCC with more than one booth. As part of a continuing effort to focus on interoperability, Design Data met with several key partners at the conference — such as Descon, FabSuite and P2 Programs — to discuss progress that has been made since the Inteoperability Network (IN) as well as any additional areas of focus for development. To recognize our IN partners and our customers exhibiting at the show, Design Data created steel signs that were distributed to select booths. The signs included the SDS/2 logo, the building intelligent connections tagline, and identified the company as either a partner or customer. Doug Evans, Design Data's vice president of sales, had the privilege of introducing the conference's keynote speaker: Charlie Carter, AISC's vice president and chief structural engineer. Charlie, one of the leading voices in connection design, presented the findings of a joint task group formed by the Council of American Structural Engineers (CASE) and the AISC Committee on the Code of Standard Practice on connection design responsibility. 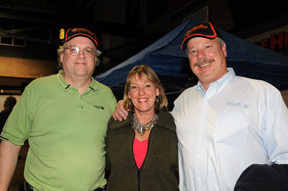 Several Design Data employees attended Peddinghaus' "Opening Day to a New Era of Fabrication" event. Held at Chase Field, home of the Arizona Diamondbacks, the networking event brought together an estimated 1,000 industry professionals.